Is it blue corn? Is it black beans? 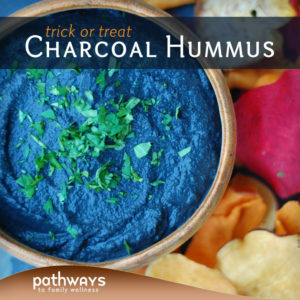 In fact, this eery looking hummus is made out of activated charcoal, and can be the perfect addition to your Halloween plans. You may have already come across this new ingredient which adds a fun twist to any recipe. Most commonly found in ice cream and bread recipes, activated charcoal has been only recently introduced to the culinary scene, and we are excited to try it. 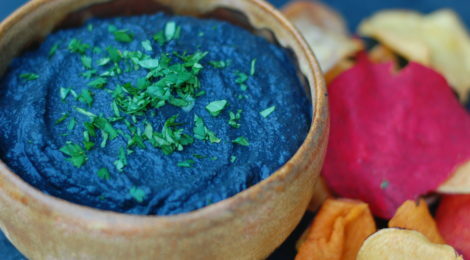 This recipe was inspired by a black bread and roasted carrot hummus recipe. The color pairings were just too vivid to ignore, so naturally we headed to the kitchen to conjure up our own spooky dish. 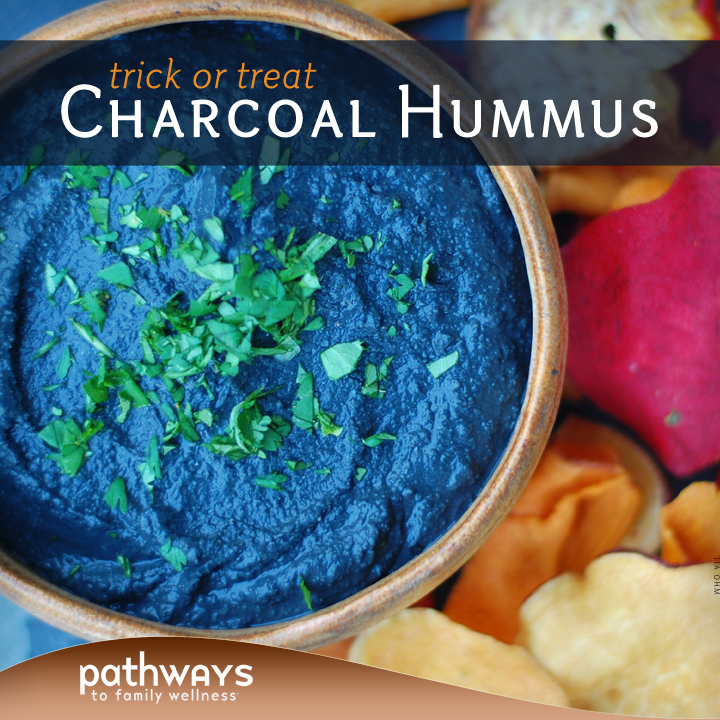 Instead of carrot hummus, we decided to create a charcoal hummus. The taste is spot on, and the color, well, you can imagine how that may trick you into thinking there is something off about it. But be fooled not, my friends, it is just hummus after all. We paired it with vegetable chips as that was an easy option. Feel free to make some homemade sweet potato chips if you are up for it, or serve with sliced carrots to create the classic Halloween color combo. Do beware as the charcoal may temporarily stain your teeth black. However it goes away as quickly as it takes for you to finish eating it. In fact, activated charcoal is known to whiten teeth. Who knows, perhaps you will walk away with a brighter smile in the long run. Trick or treat, as the saying goes, right? Well you can decide which best describes this dish. On a more serious note, let us bring to light what exactly is activated charcoal. In this article, Mercola writes about the many benefits it has to offer. However, if you are taking other medications, you may want to avoid it. “As much as possible, activated charcoal should not be taken alongside other medicines (like acetaminophen, theophylline and tricycline antidepressants) or supplements since it can block the body’s absorption of these,” says Mercola. To be safe, do your own research and determine what is best for you and your friends and family. No matter how you decide to celebrate this holiday, be sure to enjoy it! And have a happy Halloween! *Many recipes use a few tablespoons, and up to a 1/4 cup, of activated charcoal. We opted to use less because we did not want it to take on a grainy consistency. Decide what works best for you. Prepare the hummus by blending all the ingredients (except cilantro and chips/carrots) in a food processor until smooth. Top with fresh cilantro and serve with a [preferably orange] side.